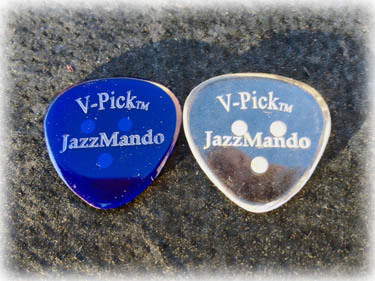 Handmade in the U.S.A. from clear acrylic, Vinni Smith's popular V-pick have been time-tested and proven for guitar and bass players around the world, and of recent, the mandolinist. 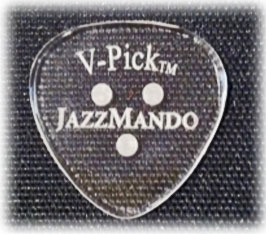 Similar to the shape and durable rigidity of the acetate cut JazzMando Signature 346 ProPlec (now discontinued), this profile lends a clean, pure attack because of a polished bevel found on more expensive custom-made boutique picks, yet at a fraction of their cost! The 1.5 mm. 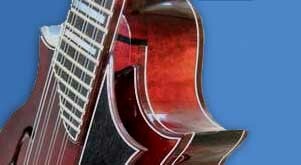 gauge thickness gives you power and fluid control over rich, meaty tone. Custom etching artwork on both sides gives the added bonus of secure grip and the exclusive geometrically placed 3-point backside reference dots help maintain an intuitive awareness of pick position while playing. The pattern lands on the thumb in a perfect, sensitive fleshy spot, and even though the acrylic packs its own tack stability; the etches yield a confidence the rounded triangle's wider real estate is gripped in the right place. Additionally, the hands of most players warm the acrylic material up in time, for additional tack a few minutes into activity. 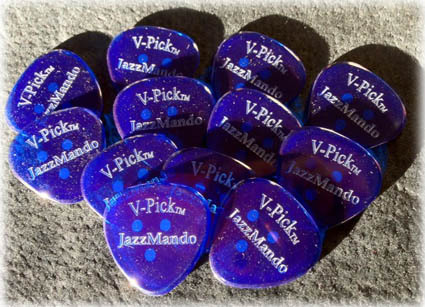 The JazzMando V-pick grows even more comfortable playing, like a pair of well-worn denim jeans. Superior manageability. 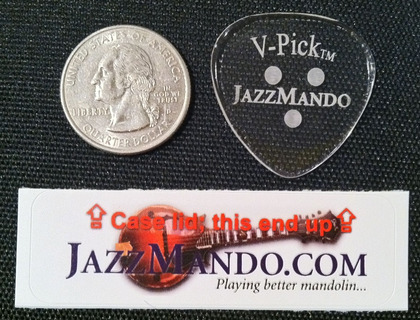 The mandolinist becomes "one with the pick."